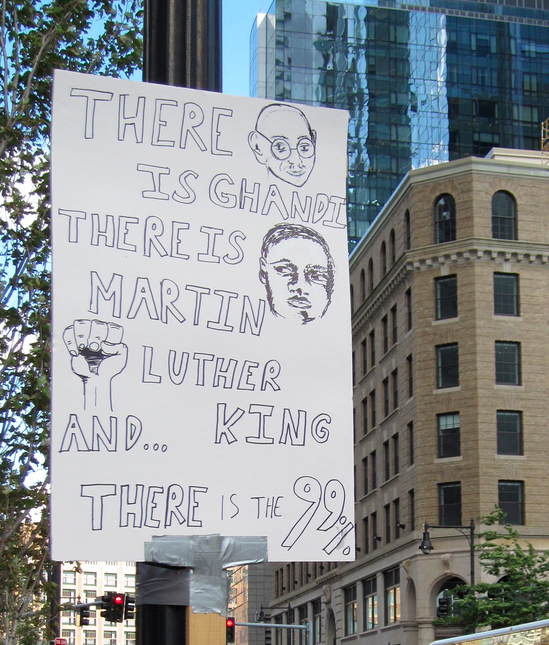 A prophetic sign from Occupy Boston (albeit with a mispelling of Gandhi). Remembering the agonies I went through when the tanks moved in on Tiananmen Square in June, 1989, I was relieved that most (I wish it were all) of the protestors who make up today’s amazing Occupy movement do not intend to occupy the symbolic spaces they are in indefinitely. This struggle is not about particular pieces of real estate but the institutions that may be associated with them—iconically, of course, Wall Street. And it would be a bad strategy—it’s always bad strategy—to hold on to symbols, especially when they make you an easy, concentrated target. The movement has empowered youth (and others) in their hundreds of thousands to demonstrate in some 1,500 locations in 82 countries, creating in the process a beautiful culture of consensus decision making. But that was the easy part. Now it is time to overturn and replace the obnoxious institutions and behaviors that have (at last) brought us together. For this, I think, three things will have to happen. 1) This has been largely a nonviolent movement; but we must realize that there’s nonviolence and nonviolence—or more conveniently put, nonviolence and non-violence, i.e. the mere absence of physical harm. The latter was well expressed by the words of a Yemeni protestor: “They cannot defeat us, because we left our guns at home.” In other words, not to irritate your oppressor is smart strategy. But the other degree of nonviolence, non-hyphenated if you will, can be heard in a ringing challenge of Gandhi’s: “It’s not nonviolence until you love your enemy.” He also characterized what he called “perfect ahimsa” (in today’s lingo, principled nonviolence) as “freedom from ill-will,” not just from weapons. In this degree of nonviolence, not to irritate your oppressor is not just strategic—useful as that may be—but a deep principle. We need to awaken this principle if we want telling, long-lasting and deep change; and to do that the protestors will have to seperate the people from the behaviors they will no longer tolerate. Cursing “cops” as was done in Oakland last week weakens us. Gratifying as they fall on our ears, labels like ‘bankster’ will have to come off, revealing people like us who got themselves into a fix because of the climate of alienation and greed in which we live. As we’ve been urging at the Metta Center for some time, every individual who wants to make her or his maximum contribution to the great change we all need should stop patronizing the mass media that got us into this mindset of alienation and greed in the first place. She or he should replace that culture, with its desperately low image of the human being, with the culture—for it is one—of nonviolence. Read all the Gandhi you can get your hands on. We have “moved our money.” Beautiful. But we’ll be amazed what happens when we move something much more powerful than money: when we move our minds. Happily, judging from the idealistic young faces I’ve seen first-hand and in YouTube videos, I don’t think this is at all impossible. I actually think it’s the challenge we’ve all been waiting for. 2) It is clear that the time is now to step back and come up with a long-term strategy. We should be no more stuck on one tactic or mode—protest—than we should be on one piece of real estate. Furthermore that strategy, as Rabbi Michael Lerner has pointed out, will have to grow past protest to include serious nonviolent resistance, e.g. civil disobedience. We are up against very serious entrenched interests backed by virtually limitless money and physical force. It can be overcome, because evil is always vulnerable, because money and force are limited instruments; but we must be prepared to meet it with an equivalent force of commitment and sacrifice. The protestors, as the media point out, have a bewildering array of issues. Well, just about all of them are valid, because the malevolent energy of the system by now reaches almost everywhere. But we will have to understand the core of that malevolence and figure out how to confront and purify it. We will have to decide on what I call a keystone issue—something that’s winnable and well-aimed enough that succeeding at it will weaken the entire system. 3) Let’s remember what we’re really fighting for. When we call for the dignity of every person, does that not imply, as I suggested above, that we need to vastly improve our image of the human being per se? We should all be conversant with the way both modern science and the world’s spiritual traditions agree that we are not separate, material creatures doomed to compete for scarce resources; we are deeply interconnected, with one another, all life, the planet that nourishes and houses us. Our fulfillment comes from relationships, not consumption; our security comes from turning enemies into friends, not from eliminating them. Six years ago I stood with a large group of young people on the roof of the student union building on the Berkeley campus, ticking off the ways they were better off in their understanding than we had been in the heady, but not very sophisticated days of the Free Speech Movement. It was exhilarating to see that improvement. It’s even more exhilarating to see it on the move. Wonderful, Michael! I’m sharing it far and wide. I echo every sentiment you express here. Metta! “Cursing “cops” as was done in Oakland last week weakens us.” well said. I hope more people can read your articles then just watch the things that are going wrong with the movement. Agreed. It’s unfortunate that this phenomenon of yelling at police has become so ingrained into the occupation movement. At the same time, though, many in the movement make friendly overtures to police, and that should be recognized as well. Deconstruction… classic Deconstruction, Derrida’s Deconstruction picks at the little tear in the wallpaper to reveal what is beneath. I want to return to this text specifically for the insight, succinctly and exactly expressed about the character of “the media”. But I want to bring with this re-reading the awareness of the need for identity that fuels this monster, that disguises, that normalises. I totally subscribe to numbers i and 3 of your requirements for fundamental change. I love number 2 but an appropriate action has me stumped. What act of civil disobedience would be most doable and widely supported??? Are people generating ideas? What is yours?